Corporate entertainment isn?t just about throwing a party for your employees, business partners and select groups of company clients. Rather, every corporate entertainment event should be about wowing audiences, making a positive lasting business impression and securing new sales leads. When you are looking for top quality corporate entertainment you very rarely get a second chance. It is important to do your research and book someone that is a specialist corporate entertainer. Your after dinner entertainment can make or break your night, it is what most people will remember about the night for either the right or wrong reasons, so take the time to get it right. The key to achieving the above? That?s simple. From musical acts to comedic performances, the corporate entertainer or corporate entertainment groups who you approach to perform at your event need to be of the highest caliber. Instead of performances which go on in the background as people enjoy drinks and conversation, the corporate entertainment which you provide needs to astonish and enthrall your audience. With over 30 years experience keeping corporate event attendees on the edge of their seats, Adam Night is one of the most in-demand corporate entertainers in the UK. From the moment he takes the stage, Adam Night dumbfounds, astonishes and enlivens audiences like no other contemporary performer. 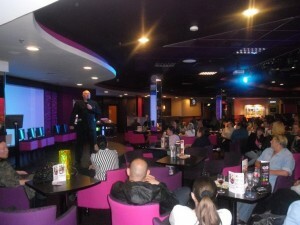 Adam Night has been amongst the top professional corporate entertainers and speakers for many years. This incredible experience has taken him all around the world (even performing for Royalty) and it has shown him how to make his shows work at any event. From a private dinner party with just a few guests to large corporate conferences of over 1500 people. Adam Night will adapt the performance to deliver maximum the impact. Are Your Audience Members Ready for a one on one Experience With the UK?s Most Accomplished Mindreader? If you really want to know what your dinner guests or clients are thinking Adam Night is the right man for the job! Far from being just a celebrated comedy stage hypnotist, Adam Night?s corporate entertainment mind reader performances routinely electrify event audiences. Enthusing attendees with non-stop demonstrations of his unnerving mind reading abilities, Adam?s shows place special emphasis on direct audience participation. This way Adam?s corporate performances become popular topics of conversation long after shows are over. An evening with Adam Night is an exciting demonstration of the power of the mind. He will read your mind and influence your decisions without you even realising he is doing it. Throughout the performance the emphasis is on humour and audience participation in the best possible taste. Having performed internationally and even for royalty, Adam Night is one of the most reliable high-quality entertainers on the UK corporate events circuit. This being the case, make sure to inquire with Adam today to ensure his availability for your next event. Also, please note that Adam?s corporate entertainment mind reader performances do not include hypnosis. (Though separate hypnosis shows are available).